I spent a few minutes trying to think of a catchy title for this post...something like "Pat Buchanan - Moron" but with more pazazz. Finally, I just decided that his name was enough and would convey the intended message. 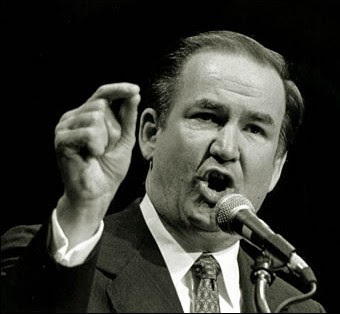 Pat Buchanan, who ran an abysmal campaign for the Republican Presidential nomination in '96 and then his joke of an attempt at the Oval Office in 2000 by snagging the Reform Party ticket at the federal campaign money that Ross Perot earned with his '96 showing. Tonight I watched him try and defend Sarah Palin's remarks about the role of the Vice President. She was asked about how she saw the role of Vice President and she blabbered on about presiding over the senate and crafting legislation. Sorry Sarah, but maybe you should read the Constitution, or watch an old School House Rock special because if you did either of those things you would know that the job of Vice President, despite what Cheney would have you believe, is to succeed the President should he be unable to carry out his office, and to break ties in the senate. It was great to see Chris Matthews chew him up and just keep telling him how wrong he was. Pat tried to make excuses for Palin by saying she was talking to 2nd or 3rd graders. While Matthews pointed out that she in fact made those remarks during a tv news interview, the idea that it's ok to misinform children about the way our government functions is even worse in a way. Children growing up today are horrifically underinformed as it is and they do not need a candidate for Vice President adding to that lack of knowledge. Sorry Pat, the jig is up. You can only hack so much for your side before you do something ridiculous like defend Sarah Palin's idiotic remarks. Register a corpse or disenfranchise a voter?